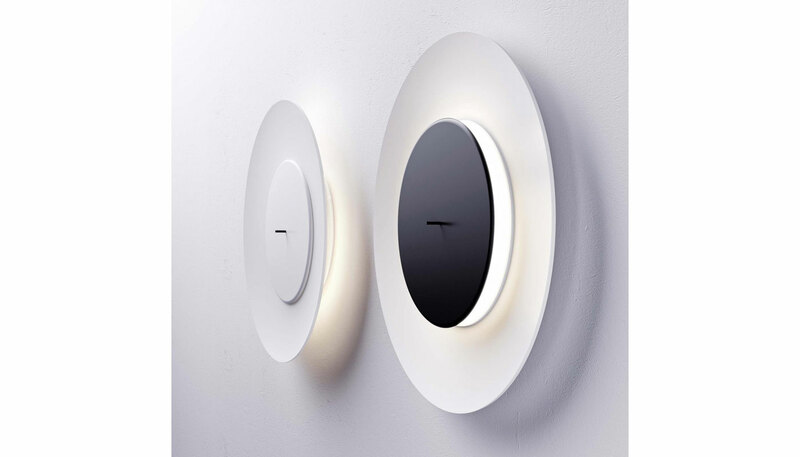 Lunaire is a wall light with a surprising light effect, reminiscent of the phenomenon produced by eclipses. A smaller front disk containingthe light source is set inside a large concave aluminium diffuser. Two different effects are possible depending on how the small diskis positioned with respect to the diffuser: back lighting when the front disk is closed, in other words pushed towards the wall, or from inside the diffuser when the disc is pulled forward. Simply pulling or pushing the rod on the front of the disk immediately changes the lightingeffect to suit the mood. Thanks to the large diameter of the diffuser, Lunaire is the perfect lighting solution for big areas,they residential or contract. ETL certified to North American standards. Manufactured by Fontana Arte.